It is gardening season across the Northern Hemisphere. My children’s interests wax and wane in the garden, but they’ve enjoyed the recent abundance of asparagus and seed planting. My daughter likes to harvest the asparagus, probably because we let her use a knife under close supervision, and my son loves to plant the seeds and dig holes. We are all anxiously awaiting the arrival of the strawberries! Over the years of organic gardening with children, I have learned to relinquish some control to perfect rows, perfect spacing, etc. Now, I have added seed and plant selection to the list of gardening enjoyments I now share with my children. It all started when the seed catalogs started arriving at the end of winter. Both of my children took an active interest in the pictures, so I suggested they start circling varieties they wanted to grow. Now that we are planting, they have a vested interest in our efforts, and I believe this will carry over to trying new foods and healthy eating from our organic garden. The folks at ZRecs, one of my favorite parenting blogs, have started a new blog called Gardenaut. Although this site is not focused on kids gardening, many of the contributors have children, which can be seen participating in their family’s gardens. Gardenaut is full of resources, such as finding small farms in your area or searching for plant info. The posts can be read by region or state, and the photographs are beautiful. I absolutely agree that we must teach our children where their food is created. We have been taken so far away from out food source that a lot of adults do not realize how food is produced. I applaud you for taking this action. How lovely and inspiring. I can’t wait till Layla is old enough and we have our own digs to start an Organic garden. 🙂 What a wonderful way to spend time with your family and appreciate mother earth together. 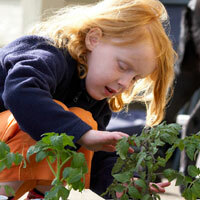 There is something so sweet and innocent about involving your children in organic gardening. Seeing their faces light up from witnessing the ‘magic’ of a tomato starting to grow on the vine is second to none.